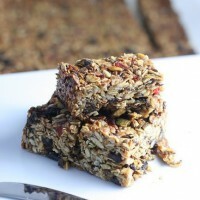 Honey, Nut Muesli slice full of nuts and seeds and fruit. 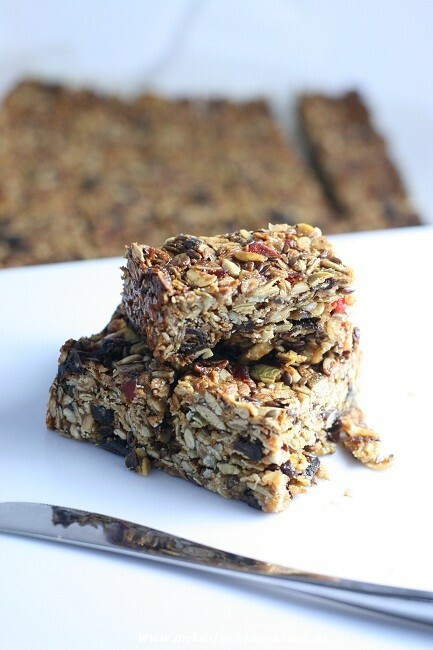 Once I used to make this Honey, Nut Muesli Slice about 10 times a week. I made it for shops, and all the time just because people at work needed it …. often. I packaged it up and delivered it to cafes in the station wagon. I can have this whipped up and in the tin ready to bake in about 10 minutes if necessary. I am sure once that you have made it a few times you will be an old hat at it too. There is sugar and butter in here along with the honey but it is a dose of fibre seeds and nuts. In fact it would make a much better breakfast than most cereals. You can be sure it has no palm oil or any other filler that might not be good for you. 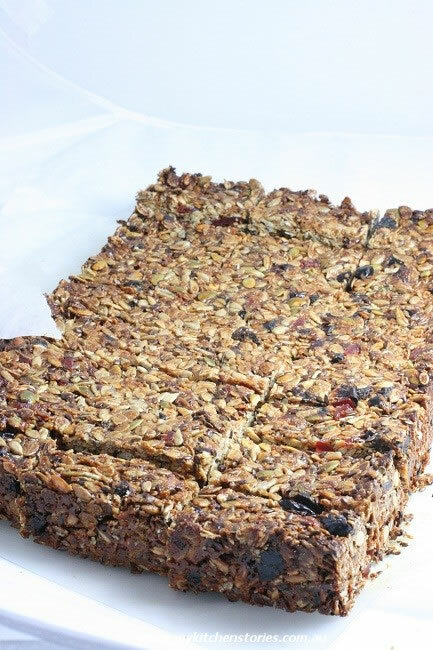 I would much rather eat this delicious easy Muesli slice than any thing you can buy from a shop and so will your friends and family. Give it a try. I love this muesli slice. Of course there is still a reasonable amount of sugar in it but it has a lot of amazing ingredients too that is far better than eating store bought junk full of palm oil. You will need to set the oven to 170 C or 340 F. This fits into a 18 cm x 25 cm square tin / 7 X 10 Inch tin. Pick a smaller rather than bigger tin or the slice will be too thin. Line it with baking paper. Mix the first 8 ingredients together in a bowl combining well. Put the butter, sugar and honey into a saucepan and heat gently until completely melted. Let this boil for 1 minute. Pour the sugar onto the oat mixture, stirring with a spoon or spatula and mix until all of the dry ingredients are coated. Put into the oven and bake until golden approximately 30 minutes. Cool completely, before removing from the tray. The edges will be a bit browner than the middle. You can use any kinds of seeds or fruits in the approximate amounts above .